In the 1970's around the time that the Opel brand was introduced to the UK, GM published a book entitled "Opel - Wheels to the World", no doubt to provide some credibility for this hitherto unknown European brand. 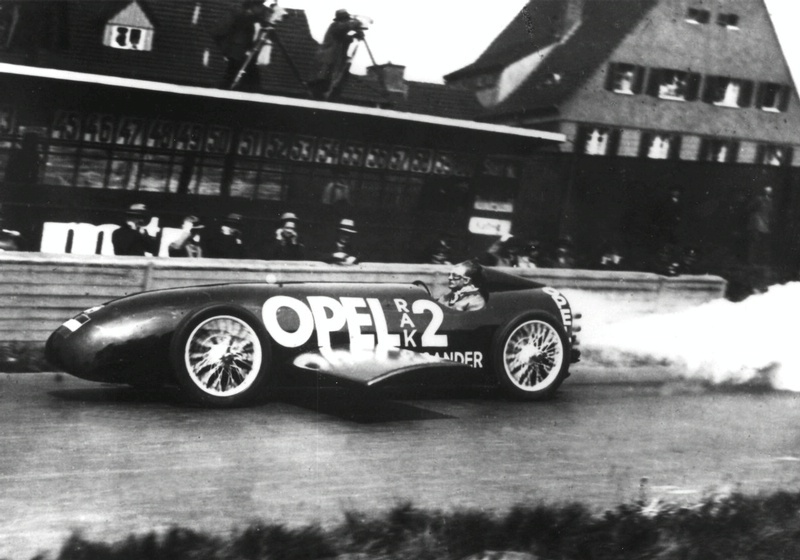 In Wheels to the World there are some lovely archive photos of the experimental rocket powered cars, I always found the image shown below both exciting and intriguing, it seems high tech for the period, whilst at the same time having a cartoon like "Wacky Races" quality to it. As it turns out this is not far from the truth, as the rocket powered cars were as much about wild publicity stunts as technical development. Sadly, the technology was to evolve from cars to gliders, then into the V1 "Doodlebug" and V2 Nazi terror weapons, these in turn, became the foundation of the first NASA space vehicles. I was watching a "Wings of the Luftwaffe" video about the development of German rocket powered aircraft in World War II and to my surprise it showed some of the cars in action. 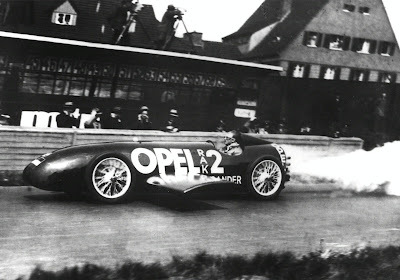 The Opel section begins at 6'03" here is a link and I have embedded the whole documentary below.